Flowing Hair Chain Cents - Immediate public Disapproval! The new chain cents were designed by Henry Voigt. They were made during early March of 1793. 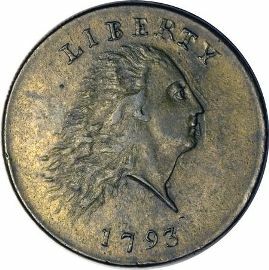 On the obverse of these copper coins is a very rough portrait of liberty that is in low relief. Liberty's hair is extremely wild and looks as though she is either in a fright or angry. 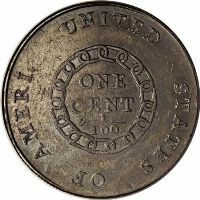 the large cents and they forced David Rittenhouse, mint director at that time, to order a change in design of the coin. This happened later in 1793 and resulted in the wreath cents being designed. 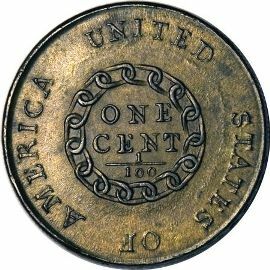 lasted a few months and was never generally accepted for circulation they are a favorite of many collectors. to wear out quickly. Thus creating a need for another to be made.